rketing and Management of Berkeley School of Business has given her strength as a Realtor as a successful marketer using the state of the art technology to get more exposure for each listing. She offers FREE Staging for all of her sellers for a faster sale and for a higher price. 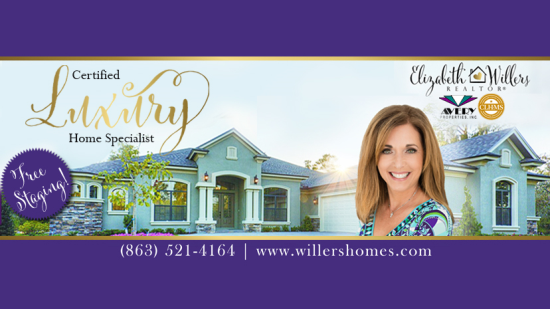 Elizabeth sales and listings have resulted her to be one of the top-producing agents for Avery Properties, a brokerage that’s been serving Lakeland for over 26 years and in her local area. Elizabeth specializes in residential in the Lakeland area and since she knows the market well, she has become an expert on staging and pricing a home to sell quickly, which creates success for her sellers. It is her commitment, experience in the market, negotiating skills, contract knowledge, and use of state of the art technology as well as her ongoing education that add to her success. Elizabeth’s goal is to exceed expectations through consistent availability, clear communication, high professional standards, courtesy, discretion and successful results for her buyers and sellers. Elizabeth enjoys being a mom of 3 grown children and a Nahnah to 4 grandchildren and has been married to Jock, CEO of the nonprofit, The FALLS Adventure, Inc., for over 36 years. 1) Exposure - using innovative digital marketing techniques and videos and staying up to date with the state of the art technology will sell your home and for top dollar. 2) Negotiator - Someone who lacks experience and knowledge can cost you money and Elizabeth has the experience and knowledge to negotiate the best deal for you. 3) Price - Elizabeth knows the market well and can price your home to sell fast and get the top amount of money for your home using state of the art market analysis and her experitise in the market. 4) Condition - Elizabeth offers FREE Staging and so she can create a home that buyers want. Ask her about a home on the market for almost 2 years and never sold until Elizabeth came in and staged it, photographed it and had a contract within 16 days. 5) Location - Elizabeth has raised her family in Lakeland for over 26 years and knows the market area well and prices your home accordingly. Some inexperienced realtors may not know the true value of your home. Being A Certified Luxury Home Specialist and Realtor gives me more exposure to market your home. I can market to 460K agents to get maximum exposure for your home.